How do I perform a clean uninstall of Zoolz? /Troubleshooting /How do I perform a clean uninstall of Zoolz? Go to your Control Panel → Programs and Features → Zoolz2 → Uninstall. 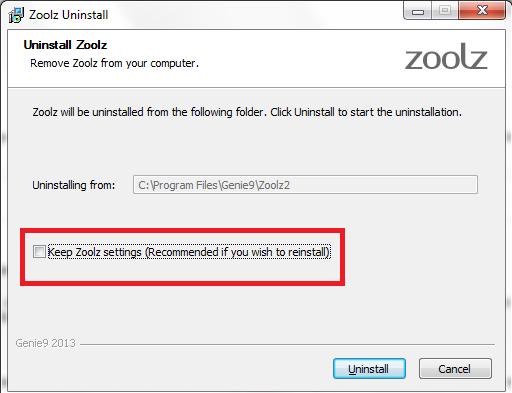 Now, Zoolz Uninstall wizard will start, to perform a clean uninstall, make sure that the option Keep Zoolz Settings (Recommended if you wish to reinstall) is not selected. Proceed with the uninstallation wizard. If you chose not to keep Zoolz settings, you will need to start a new backup from scratch and Zoolz won’t recognize the older backup of this machine.